It only dawned on me at a friends hen's night (hi Neen!) how much stuff I keep in my handbag. We had a little game where we needed to tick on a list the things that were currently in our bag. I didn't win, but I came pretty close. Now there is the normal female's bag contents... things like a purse, mobile phone, tissues or hankie, keys, notebook - you get the picture. Then there are those strange extras that I seem to carry. Why do I sometimes find a dirty pair of baby socks in my bag, a dummy and cloth, a guitar pick (when I don't have a guitar anymore), a packet of wipes, a packet of raisins, a black little round thing that has fallen off something... the list could go on, but I do have a point to my ramblings. Lately, I have become so frustrated in the simple task of finding my keys in my bag, and finding my mobile (especially when it is ringing). So this frustration led me to desgining and making my first tote bag! I made it up last night and took it for a test drive on our family trip to the library today - and it works great! 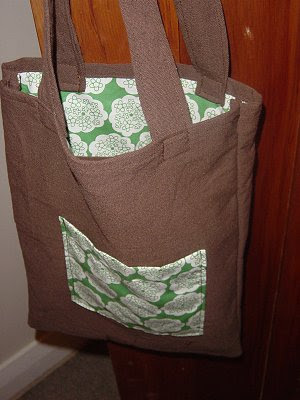 I have used two $1 brown teatowels (new) and green fabric. 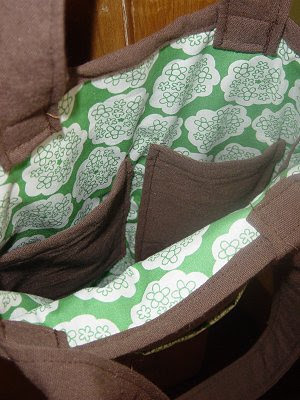 The tote is lined and has two special pockets on the inside, especially for my mobile and keys. Yay - problem solved. The 'Proverbs 31' woman matures! Love it! A bag has totally been on my list of things to make for AGES. Just not enough hours in the day! Yep, it's crazy what we find in our handbags! The tote looks great! Ooo that is so cute! Wow Kristy, you are good a t everything! !